“May all your storms be weathered. May all that’s good better. On this date in 1934 in our jazz history, vocalist/pianist extraordinaire Shirley Horn was born in Washington, D.C.
My personal love affair with Shirley began in 1993. 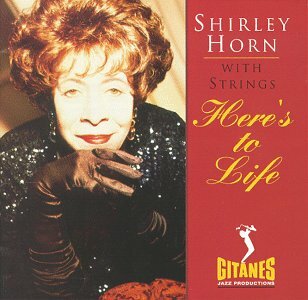 Upon a friend’s recommendation, I bought the Glengarry Glen Ross movie soundtrack which introduced me to Shirley singing “You’d Better Go Now” and also Jimmy Scott singing “Street of Dreams.” About a month later, I was shopping for music and saw Shirley’s “Here’s To Life” CD and purchased it. I was in euphoria. Never had I heard such wonderful phrasing sang slowly coupled with such brilliant yet efficient piano playing. I saw her in concert for the first time at Ravinia just days before my 30th birthday. From beginning to end, it was sheer pleasure. I was seated so that I could see her fingers touch the keys while she played and sang her enchantingly beautiful melodies. She had the ability to make the most from silence. I have seen her several times since and each time has been amazing. I now own 19 of her CD’s and every compilation I can find that she has sung on. I would recommend her 1992 album “Here’s to Life” as the quintessential album for your collection. It was produced by Johnny Mandel and every song is a treasure. I once read that “songs are happy when Shirley sings them.” I know this to be true. For a real treat, check out the Shirley Horn Discography. It is definitely an impressive body of work. This entry was posted on Thursday, May 1st, 2003 at 6:47 am. It is filed under Music Reviews, Shirley Horn and tagged with discography, legend, piano, Shirley Horn, The Shirley Horn Essentials, vocals. You can follow any responses to this entry through the RSS 2.0 feed. ok, after reading this post i realize i have quite a few shirley horn pieces in my collection. i was introduced to her back in 1997 and loved her immediately. thank God i don’t have to worry about *that* anymore. You know, I fell in love with Shirley Horn after seeing her on PBS (?) a few years ago. I’m with Nakachi, can’t believe I lived that long without her singular style. Altho I still don’t own any of her recordings. I’m gonna have to make a music run and raid dad’s music room. James, you are a remarkable resource and I must make a point to check you out much more frequently.